With views of the glorious open countryside from the large private pool and towards the sea from the first floor, Villa Thea Kalathos is ideal for a relaxing getaway. 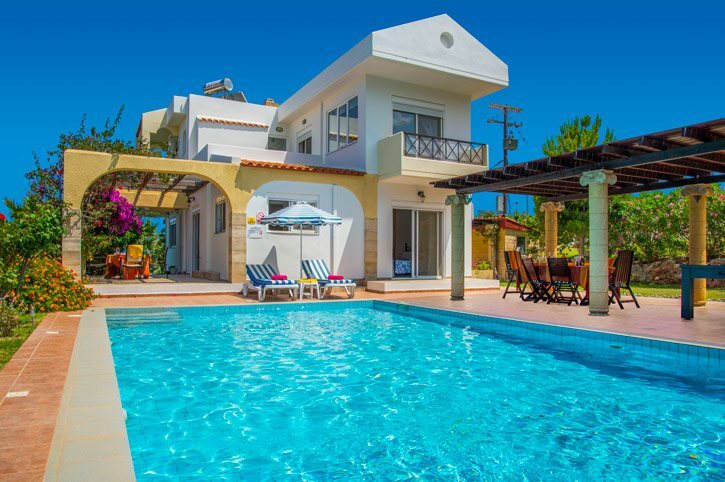 This 3 bedroom villa is located in the village of Kalathos, 5 minutes' drive from a wide selection of restaurants, bars and shops, plus the sandy beach. What's more the charming resort of Lindos is just 10 minutes away by car. WiFi and air conditioning/heating in all the bedrooms and lounge are included. The relaxing setting with picturesque countryside views from the large pool plus an attractive garden. Bliss! The swimming pool is the ideal place to relax on one of the sun loungers and embrace the countryside views. There's an alfresco dining area located under the large pergola with the brick BBQ close at hand for preparing some delicious food. An established garden adds colour with a lawn bordering the property. Approaching the villa there is a gated entrance with a large private driveway and plenty of space for your hire cars. The main door is at the side of the villa, where there's a pergola decorated with pretty bougainvillea. It has a small seating area and the garden path leads to the swimming pool. The lounge looks out over the attractive garden with patio doors providing direct access. It's furnished with 2 sofas facing the flat screen TV and feature fireplace, and is connected to the dining room via an archway. There a further set of patio doors out to the side terrace. The fully equipped, light and airy kitchen is adjacent with all you need for preparing your holiday meals. To the back of the villa is a twin bedroom with patio doors that lead out to the garden and pool, plus a separate bathroom. A wide sweeping spiral staircase leads to the first floor and 2 double bedrooms. The first double bedroom is spacious with a shower unit in one corner and access to a private balcony overlooking the pool. The second double bedroom has a private balcony with stunning views across the countryside towards the sea. There is also a shared balcony which is accessed from the landing, as well as a separate bathroom. This villa is registered and licenced by EOT Greek licensing association. This number is: 1476K92000413101. This villa is set in tranquil countryside with views of the village and olive groves. There is a small selection of local amenities in Kalathos Village including shops, as well as several tavernas and bars along the road towards the beach. Just a short drive from Villa Thea Kalathos is the quaint town of Lindos that has a wide selection of eateries, bars and shops, as well as a beach - perfect for a day out. On the main road there is a bakery, chemist and 2 petrol stations. Historical Lindos is the neighbouring village, a 5 minute drive south of Kalathos, offering plenty of little shops and market stalls. Alternatively, head north to Rhodes Town where you will find some high street names as well as designer and independent stores. There are some cafe bars and traditional tavernas that can be found along the beach road in Kalathos. For more sophisticated dining an evening in Lindos is highly recommended. Kalathos Beach is uncrowded and stretches along the coastline. The sea is crystal clear and along the beach front are a couple of bars, as well as sunbeds and umbrellas available for hire. Haraki is just 10 minutes' drive north of Kalathos where you will find Agathi Beach, which is one of the attractive golden sandy beaches on the island. Nearby Lindos has 3 sandy beaches; the main beach, Pallas Beach and St Pauls Bay. There are water sports on Kalathos Beach and Lindos Beach. For something different donkey rides are available to Lindos Acropolis. Mini golf, glass bottom boat trips and go-karts are in Lardos. For a fun family day out, why not go to Water Land at Tsambika Beach or the waterpark in Faliraki? Lindos Acropolis is a must, either by foot or on a local donkey taxi. It dates back to 9th century BC and is steeped in history with fantastic views of the area. On the South West Coast of the island is Monolithos Castle that was built in 1480 to protect the island from invaders. Access to the castle is by a staircase cut into the rock but it can also be viewed from the road side. The old town of Rhodes is contained within the city walls. it is a complex layout of approximately 200 streets. The Street of the Knights is one of the best preserved and most delightful medieval relics in the world. Afandou Golf Course is located on the main Rhodes-Lindos road and offers an 18-hole, par 73 golf course. It is open all year round. There are plenty of water sports readily available on the island including sailing, paddle boarding, and windsurfing. Why not try your hand at scuba diving, as the Lepia Dive Centre in Lindos caters for a range of abilities? If you prefer to keep your feet on dry land, horse riding is available in the nearby village of Laerma on the Elpida Ranch. Villa Thea Kalathos is not available to book for season as it is sold out. Take a look here at the Rhodes villas that are currently on sale. There are 2 companies that offer instructions for beginners as well as advanced courses and challenging dives for the qualified. Trident depart from Mandraki harbour every morning contact (George) 22410 29160 or 306944368444 and Waterhoppers, Divemed have a school in Lindos contact (David) 0030 6972500971. Spectacular views and excellent facilities. We would definitely book this villa again. Perfect location. Perfect villa. Perfect support from rep and caretaker.